During the year that has just concluded, a good deal of my mental energy was devoted to Salvador Dali and his paranoiac-critical method. The paranoiac method was one of the keys to my study of Dali and James Joyce. For Dali, one of his favorite means of sharing this theory was always his deep infatuation with Millet's famous painting The Angelus (this was discussed in more detail here). During the 1930s, Dali penned a book-length analysis of this seemingly simple painting, asserting that the two farmers, who appear to be observing the daily Angelus prayer devotions in their field, are actually kneeling over a tiny casket. 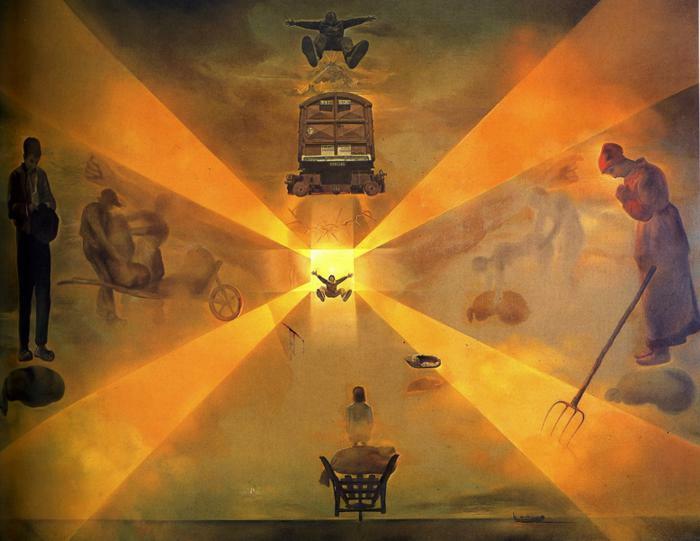 Millet decided to paint over the casket, Dali declared, because it came across as too morbid. In the early 1960s, Dali arranged to have the original Angelus painting x-rayed at the Louvre museum laboratory in Paris. He and his longtime companion Gala left their home in Cadaqués and headed toward the train station at the town of Perpignan in Spain. While waiting at the station, Dali experienced a deep realization. Standing amid a mass of railway travelers he felt isolated. "I sit on my bench as at a border crossing, I feel myself available, and intense jubilation invades me, a monumental joyfulness," he writes. He came to the "overpoweringly evident" realization that there in the Perpignan train station was the center of the universe. He outlines this experience through glowing language and wit in The Unspeakable Confessions of Salvador Dali, pgs 156-159. So, for years, the station at Perpignan has been a source of enlightenment, a cathedral of intuition to me. I long thought it was because genius needed a trivial place in which to assert itself. The Parthenon and Niagara Falls are too overwhelming! The absurd and the anodyne are better handmaidens to enlightenment. The memories of the unconscious let their passages get through only when the mind is vacant, and toilet seats are a high place for the state of grace, quite as good as the Perpignan station. He goes on to describe his vision of the station as center of the universe in more precise scientific terms. Physical, mathematical and astronomical sciences are split over whether the world is finite or infinite. No one has yet answered that key question. At that moment, I knew that the world is limited on only one side, which is its axis. I cannot put into words the vision and certainty I had, but from that moment on there was no longer any doubt in me: cosmic space began in front of the facade of the Perpignan station in the area marked off by the circle of cables, and the universe ended at the same point... Non-Euclidian space stopped at the point where it met the dimension of the mind. This limit could not be defined but could appear only as a vision, a snapshot of absolute time-space that illuminated me viscerally. 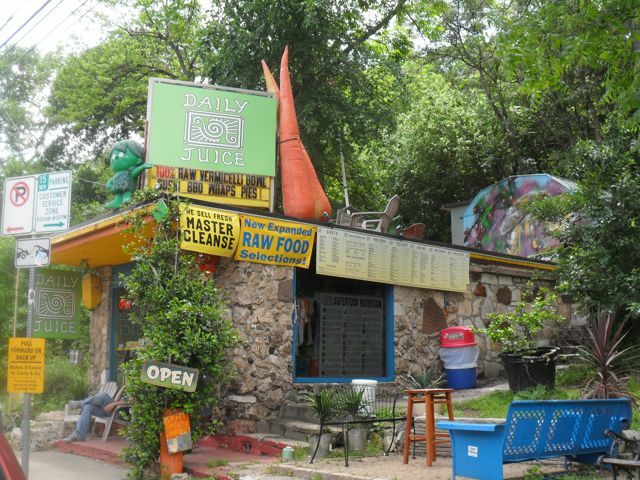 With these heavy words clanking around in my brain this summer, I discovered a densely packed little shop along Barton Springs Road here in Austin, Texas, just a bit south of the Colorado River that splits the city. The aura of this little place, a juicebar called Daily Juice (its name recently changed to Juice Land) struck me in the same way the Perpignan station hit Dali and I declared to anyone who would listen to such absurdity, that the Juice Land on Barton Springs Road is the center of the universe. The little building is thoroughly decorated both inside and out, the inner walls covered in artwork, articles, bumper stickers carrying powerful quotes ("We have guided missiles and misguided men" by MLK is perhaps my favorite), and even album covers, including one of MF DOOM's classics. Above a refrigerator there is even a diorama displaying a miniature reproduction of the building itself. The place is tiny and built mostly out of stone so it has the appearance of a little hut carved into the side of a hill. It reeks of chlorophyll, its menu of juices and smoothies is vast and just about every single time I've been in there, the entire place is vibrating with the thumping sound waves of some beautiful obscure music. Tonight begins the entry of the Quadrantids meteor shower into the Earth's celestial sphere and my evening has been imbued with the music of Quantic and his mighty orchestra. Quantic's real name is Will Holland, he is a musician currently residing in the city of Cali, Colombia, the same city wherefrom my brother's wife hails. Within her womb rests the newest member of the vast Quadrino clan, a little girl named Valentina, expected to appear sometime in late April. I will hopefully be headed eastward to Florida around that time to welcome her to the world. expect plenty more analysis, discussion, etc. of James Joyce and his two great epics. perhaps most importantly, I'm ever so slowly working on a book with two of my favorite living artists: Bronze Nazareth of the Wu-Tang tribe, and his brother Kevlaar 7 (both part of their own hip hop crew called The Wisemen). I was excited to see this officially mentioned by Bronze himself in an interview a couple of weeks ago.